State Department spokeswoman Jen Psaki urges all sides to "avoid escalating tensions" in the wake of Jerusalem terror attack. The United States on Wednesday condemned the terrorist attack at a Jerusalem Light Rail station. "We express our deepest condolences to the family of the baby, reportedly an American citizen, who was killed in this despicable attack," State Department spokeswoman Jen Psaki said in a statement quoted by AFP. "We urge all sides to maintain calm and avoid escalating tensions in the wake of this incident," she added. 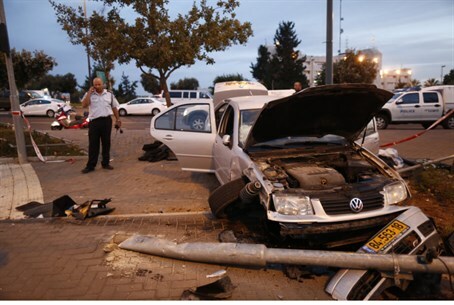 The attack occurred when a Hamas terrorist from the neighborhood of Silwan arrived with his car at the Givat Hatachmoshet (Ammunition Hill) Light Rail stop and ran over the people who were there. Eight other people were injured in the attack. A Jerusalem police officer shot the terrorist and seriously wounded him after he attempted to flee from the scene on foot. The terrorist died in hospital later on Wednesday. The baby who was murdered in the attack, three-month-old Chaya Zisel Braun, was laid to rest in Jerusalem on Wednesday night. The funeral was attended by hundreds, including President Reuven Rivlin, the Chief Rabbi of Jerusalem Rabbi Shlomo Moshe Amar and Jerusalem Mayor Nir Barkat. Wednesday’s attack is the latest in what has come to be known as the "silent intifada". Throughout this time period, Arab extremists have rioting and carrying out violent attacks in Jerusalem on a daily basis. The deadly attack took place one day after the police announced the formation of a new task force to combat ongoing violence in Jerusalem.